Welcome to this web site! On this home page you'll be introduced to the debate surrounding gun control. I hope that you'll take time to look through the information that I have gathered. My mission is to educate the public about the issues that surround the gun control debate in America. I hope to be able to shed some light on the myths and half truths that surround so much of this issue. Comments and questions can be sent to webmaster@guninformation.org. MYTH: The crime rate has been skyrocketing in the UK and Australia since stricter gun control laws were enacted in 1996-1997. 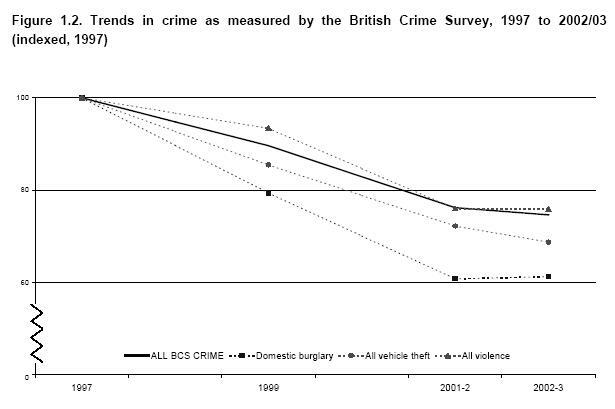 Here is a graph from the British Crime Survey. You can see that the gun lobby's claim that violent crime skyrocketed in the England after their 1997 handgun ban is clearly false. The claim that following the gun ban Australia experienced big increases in crime has been refuted as an urban legend at www.snopes.com, a website that is devoted to exposing urban legends. "Given this context, any claims based on statistics (even accurate ones) which posit a cause-and-effect relationship between the gun buyback program and increased crime rates because 'criminals now are guaranteed that their prey is unarmed' are automatically suspect, since the average Australian citizen didn't own firearms even before the buyback." (source). Australia's homicide rate is lower than the homicide rate in the US and there has been a decline in Australia's homicide rate since their gun buyback (source). Not surprisingly, the National Rifle Association didn't let the facts get in the way of its claims that stricter gun laws had caused an increase in crime in Australia. Attorney-General of Australia, Daryl Williams, pointed out in letter to Charlton Heston that "firearms are being used less often in murder, attempted murder, assault, sexual assault and armed robbery in 1998 compared with 1997." He also stated in his letter, "The 54 firearm-related homicides in Australia in 1998 equate to a rate of only 0.28 per 100,000 people. I have been advised that this compares to a rate which is in the order of 4 per 100,000 in the United States. Now that you have the facts, I request that you withdraw immediately the misleading information from your latest campaign." MYTH: Keeping guns in the home increases personal protection. TRUTH: Obviously, self defense is not a good argument against gun control since those who own firearms are actually more likely to be victims of homicide. Two studies published in The New England Journal of Medicine revealed that keeping a gun in the home increases the risk of both suicide and homicide. Keeping a gun in the home makes it 2.7 times more likely that someone will be a victim of homicide in your home (in almost all cases the victim is either related to or intimately acquainted with the murderer) (source) and 4.8 times more likely that someone will commit suicide (source). Guns make it more likely that a suicide attempt will be successful than if other means were used such as sleeping pills. MYTH:"Guns don't kill, people kill people" is a good argument against gun control. TRUTH: This pro-gun argument makes about as much sense as claiming that "glasses don't see, eyes see" is a good argument against wearing glasses. Glasses are a tool which help people to see just as guns are a tool that help people to kill and injure others. Empirical research indicates that firearms increase the chances that a crime will turn deadly. A study done by the National Commission on the Causes and Prevention of Violence reported that a victim is about five times more likely to survive if an attacker is armed with a knife rather than a gun (source). Furthermore, The International Crime Victim Survey concluded that there is a correlation between gun ownership and an increase in both homicide and suicide. "The present study, based on a sample of eighteen countries, confirms the result of previous work based on the 14 countries surveyed during the first International Crime Survey. Substantial correlations were found between gun ownership and gun-related as well as total homicide and suicide rates. Widespread gun ownership has not been found to reduce the likelihood of fatal events committed with other means. Thus, people do not turn to knives and other potentially lethal weapons less often when more guns are available, but more guns usually means more victims of homicide and suicide." (source- PDF File). MYTH: Guns are used defensively 2.5 million times each year in the US. TRUTH: Gary Kleck conducted a survey which concluded that 2.5 million people in the US each year use guns to defend themselves. One percent of the US population is between 2 and 3 million. So if only one percent of the survey respondents had answered the survey dishonestly that would make the results of the survey inaccurate by millions. According to the NCVS (National Crime Victim Survey) guns are used defensively less than 100,000 times each year (source). The NCVS surveyed over 90,000 people. In contrast, Kleck only surveyed about 5,000 people. Thus it would be reasonable to conclude that the NCVS provides a more reliable estimate of the number of defensive gun uses in the US. An article published in the Journal of Criminal Law and Criminology (Northwestern)87 (1997): 1430 revealed that using methods similiar to Kleck's, it could be concluded that nearly 20 million Americans have seen aircraft from another planet and that one million Americans have had contact with aliens. MYTH: A decrease in crime in Kennesaw, Georgia after it passed a law which required people to keep a firearm in their homes shows that guns reduce crime. The gun ownership rate of Kennesaw could have actually decreased because there has been a big increase in the population of Kennesaw since 1982, and it's not certain how many of the new residents abide by the ordinance. Nationwide the gun ownership rate has decreased according to the General Social Survey. So if Kennesaw has followed nationwide trends the gun ownership rate in Kennesaw would have also declined. MYTH: People in Switzerland are heavily armed. There is an assault weapon in every Swiss home. TRUTH: It's true that Swiss soldiers are required to keep their assault rifles at home. How big is the Swiss Army? 400,000 (source). There are about 3 million Swiss households (source- PDF file). 400,000/3,000,000= 0.133. Therefore, there is a military assault rifle in about 13% of Swiss homes. Switzerland also has rather strict gun control laws. In Switzerland a permit is required in order to purchase a weapon (The permit shows that you are at least 18 and don't have a criminal record). A permit is also required to carrry a weapon. Such a permit is mostly issued to people who work in security-type occupations. To obtain this permit, you have to demonstrate that you need to carry a weapon and that you know how to handle a gun safely and have knowledge of the law regarding firearms use (source). Soldiers in the Swiss Army are required to store their military weapons at home under lock and key and to undergo regular training. Strict gun laws in Switzerland minimize the dangers of gun ownership. However, such dangers can not be completely eliminated as illustrated by the case of Friedrich Leibacher who rushed into a session of parliament in the Swiss town of Zug. He used his Swiss Army assault rifle and a grenade to murder fourteen people. Eleven of these people were lawmakers (source) . MYTH: The 1976 handgun ban in Washington D.C. caused an increase in crime. TRUTH: The handgun ban has prevented 47 deaths each year (source) Gun control has saved lives. Let's look at a graph that displays information about the homicide rate in the District of Columbia a decade before the ban and a decade after. There are random fluctuations in the crime rate from year to year so it's best to look at homicide data from many years. In the decade preceding the ban, the homicide rate exceeded 35 per 100,000 4 times. In the decade following the ban this happened only once. The average homicide rate of the ten years that followed the ban was lower than the homicide rate of the previous decade. Was this part of a general decrease in homicide that would have happened without the ban? If that were so you would expect the non-gun homicide rate to have declined as well as the gun homicide rate. However, there was only a statistically significant decrease in the number of homicides that involved firearms. MYTH: If you outlaw guns only the outlaws will have guns. TRUTH: If you outlaw guns, very few criminals will have guns. In America guns start out legal. Then they enter the black market one way or the other (source). So if you have less legal guns then there will less guns entering the black market and consequently less outlaws owning guns. Think about it. Nations with very strict gun control laws such as the UK, Australia, and Japan have much lower gun crime rates than the US. The most probable explanation for this is that criminals in the US have much greater access to guns due to less gun control. Saying "If you outlaw guns only the outlaws will have guns" is very misleading and completely absurd. If you outlaw guns, less outlaws will have guns. Would you rather have more or less outlaws owning guns? The answer is obvious. MYTH:Gun ownership is a protection against political tyranny.